Moving to the Cloud, Upgrading your SharePoint version or moving to SharePoint from another system? Thinking of reorganizing data after Acquisition or Merger? 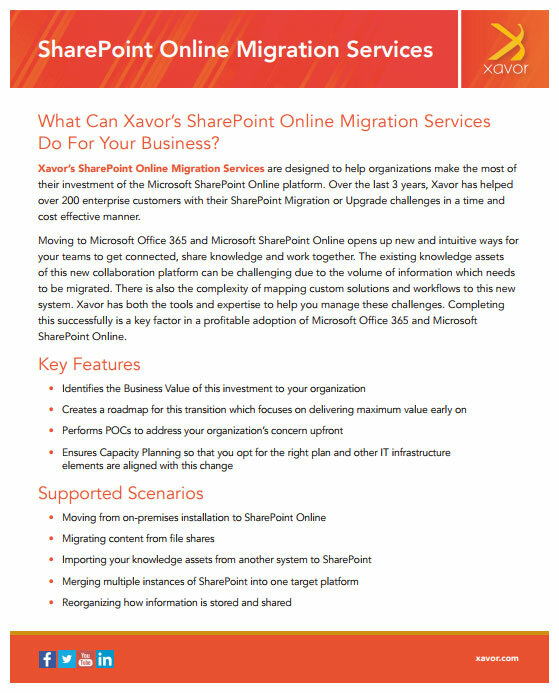 What Can Xavor’s SharePoint Online Migration Services Do For Your Business? Xavor’s SharePoint Online Migration Services are designed to help organizations make the most of their investment of the Microsoft SharePoint Online platform. Over the last 3 years, Xavor has helped over 200 enterprise customers with their SharePoint Migration or Upgrade challenges in a time and cost effective manner. Moving to Microsoft Office 365 and Microsoft SharePoint Online opens up new and intuitive ways for your teams to get connected, share knowledge and work together. The existing knowledge assets of this new collaboration platform can be challenging due to the volume of information which needs to be migrated. There is also the complexity of mapping custom solutions and workflows to this new system. Xavor has both the tools and expertise to help you manage these challenges. Completing this successfully is a key factor in a profitable adoption of Microsoft Office 365 and Microsoft SharePoint Online. Our methodology ensures that we identify risks faster and engage with business users earlier in the process. We also establish visibility across the user community and measure utilization to improve adoption.